Following his debut Dayton Literary Peace Prize-winning novel, The Great Glass Sea, Sue Kaufman Prize winner and National Book Foundation "5 Under 35" author Josh Weil brings together stories selected from a decade of work in one stellar new collection that explores themes of progress, the pursuit of knowledge, and humankind's eternal attempt to decrease the darkness in the world. Beginning at the dawn of the past century, in the early days of electrification, and moving into an imagined future in which the world is lit day and night, each tale in The Age of Perpetual Light follows deeply-felt characters through different eras in American history; from a Jewish dry goods peddler who falls in love with an Amish woman while showing her the wonders of an Edison Lamp, to a 1940 farmers' uprising against the unfair practices of a power company, a Serbian immigrant teenage boy in 1990's Vermont desperate to catch a glimpse of an experimental satellite, to a back-to-the-land couple forced to grapple with their daughter's autism during winter's longest night. 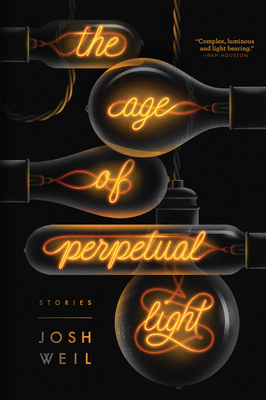 As he did with the rough-living figures in his soulful and "devastatingly memorable" (Binnie Kirshenbaum) The New Valley, in The Age of Perpetual Light Weil explores through his unforgettable characters our most complex and fraught desires. Brilliantly hewn and piercingly observant, these are tales that speak to the all-too-human desire for advancement and the struggle of wounded hearts to find a salve, no matter what the cost. This is a breathtaking book from one of our brightest literary lights. Josh Weil is the author of The Great Glass Sea and The New Valley. A Fulbright Fellow and National Book Foundation 5 under 35 honoree, he has been awarded The American Academy of Arts and Letters' Sue Kaufman Prize, the Dayton Literary Peace Prize, and a Pushcart. He lives in California's Sierra Nevada.